Amazon is building five new warehouses across the United States like this 800,000 square foot behemoth. Amazon's notoriously low prices have always given traditional retailers a run for their money. But as the online behemoth builds new warehouses to cut shipping times, small shops are getting even more nervous. Amazon (AMZN) already has 40 massive fulfillment centers around the country, helping it provide remarkably speedy delivery. "Prime" subscribers get free shipping with even faster delivery: Two days, guaranteed. But it's about to get even faster, as Amazon builds another five distribution centers this year. The company won't disclose where, but the warehouses are expected to be near several major cities -- including rumored locations outside of Manhattan. Joe Perrotto owns Power Equipment Plus, an outdoor equipment retailer with three locations, including one outside of Philadelphia. He already keeps a close eye on what Amazon charges for things like lawn mowers and leaf blowers and tries to price his products accordingly. But faster Amazon delivery will squeeze him further. "They'll have the convenience and immediacy of retail," said Perrotto. "Ultimately, it's going to erode our profitability as we try to offer a price advantage to counter their convenience advantage." It's the latest in what some view as Amazon's war on small businesses. First came the rock-bottom prices. Then came the Price Check app, allowing shoppers to scan items and compare in-store prices to those on Amazon -- essentially turning independent shops into a showroom for Amazon. Amazon didn't comment about its impact on small businesses, but spokeswoman Kelly Cheeseman did say new fulfillment centers have boosted local employment and increased demand at restaurants. For example, Ziggy's Pizza & Sandwich Shop in Gladeville, Tenn., saw its daily deliveries jump 20% this year after Amazon's warehouse opened in a nearby town. "It's definitely a positive for the community," said Ziggy's owner Adam Shireman. Other small business owners welcome Amazon's expansion and hope to ride the wave with it. Sara Selepouchin Villari produces her own line of handcrafted towels and sells them directly to Amazon, which stores them in nine warehouses across the country. It takes care of the orders, shipping and pays Villari a cut. 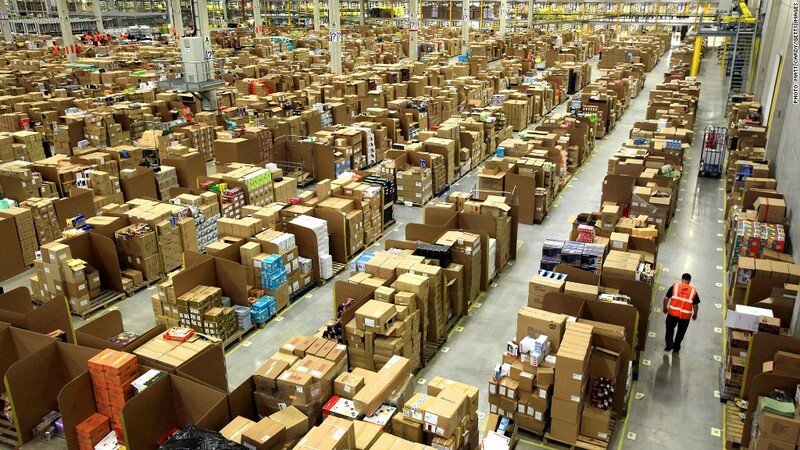 The more warehouses Amazon adds, the closer she is to her customers. "During the holidays, it'll be awesome," she said. 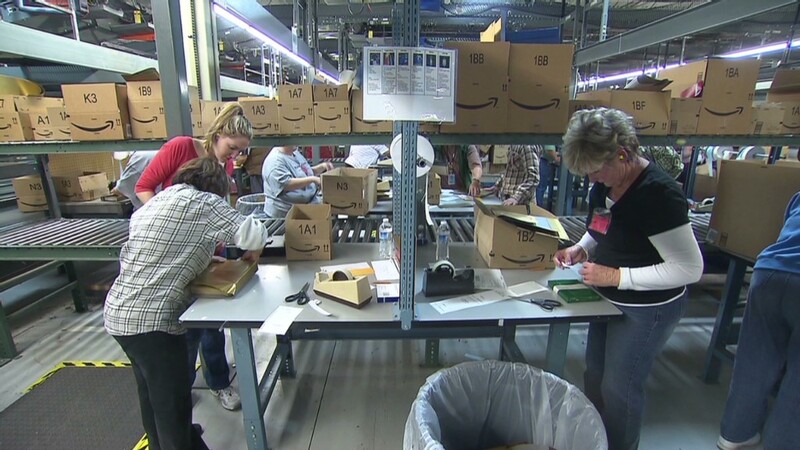 "When I have customers asking about expedited shipping, I'll be able to point them to Amazon. I'm going to go home and have dinner with my family." Villari also owns a boutique in Philadelphia, Girls Can Tell, but she's not worried customers will turn to Amazon. While Amazon threatens stores that sell generic items easily found online, Villari has filled her shop with unique artisan products. "A good boutique has been curated. You're going to stumble upon gifts you never knew existed," she said. But benefiting from Amazon's new warehouses isn't an option for Meyer Dagmy, owner of the Mashern Army/Navy supply store in New York City. He tried selling through Amazon, but found it almost impossible to sell his goods at prices that could compete online. In some cases, he'd even lose money on a sale. Now he just hopes Amazon stays away from his specialty: Military and tactical gear. "Amazon's got bigger fish to fry than me. But if they get into my niche, they could take me out of business," he said.